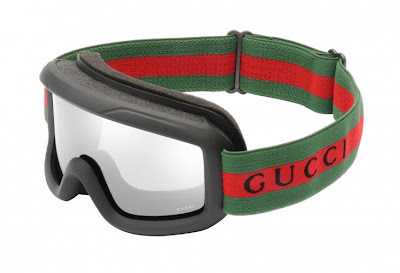 For the winter 2011/2012 season, Gucci introduces its latest range of ski goggles for adults and children – the perfect accessory that luxuriously combines sport and style. Part of the young and dynamic Gucci Eyeweb styles, the unisex goggles this season include two new colours, polished gold and polished silver. The gold model features a gold lens and a elasticated headband in black-beige-black web stripe, while the silver version has a mirrored silver lens and a grey-white-grey web stripe. Complete with the Gucci logo on the front, the model is also available in the classic colours of white and black with silver mirrored lenses. The elastic headband bears the House’s iconic green-red-green web stripe. Recently launched, the children’s eyewear collection now presents its first ski goggle. Similar to the adult style, the children’s goggle also uses a mirrored lens and is offered in four variations: matte white and matte black with the elastic headband in the iconic green-red-green web stripe, in polished gold with black-beige-black web stripe and in silver with white-grey-white web stripe. High-tech construction and premium quality bring to life the House’s glamorous details and distinctive design. The front of the goggle is made of painted polyurethane, a high-strength thermoplastic, whereas the dual lens, spherical in the adult goggles and cylindrical for the children’s version, eliminates fog with an effective thermal barrier while also providing total UV protection.